raises many new questions about the mysterious moon. scientists have found evidence for a much more exciting possibility. of the Old Faithful geyser in Yellowstone. exists: Jupiter's moon Io, Earth, and possibly Neptune's moon Triton. water may be no more than tens of meters below the surface." chance to take hold in the moon's interior? Cassini orbiter was designed, developed and assembled at JPL. it should be safe as well. observation to cover more of the same region. What to do? hoped to have lakes in its future. showed a burn duration of 33.8 seconds, giving a delta-V of 5.4 m/sec. downlink rates will resume on August 10.
and backyard section to "Saturn System Science" to find it. spacecraft to study the Sun's corona, or outer region. says "THANKS" back to the public. We are looking forward to it too! released but may be ordered and will ship as it arrives at distributors. See your local bookstore - either electronic or traditional. excellent state of health and all subsystems are operating normally. latest press releases and images. establish the nature of the solar wind. real-time operations area this evening. attitude and 1896 bps telemetry. scheduled to start. Remember this is only a test! The Science Operations Plan Update kickoff meeting for S26 was held today. entitled "Messages from the Icy Saturnian Satellites." during solar conjunction to aid in an experiment being run at Arecibo. will officially end this Sunday, August 13.
did well - this should make the real thing - if it ever happens - look easy! Sigma Ratio error monitor unexpectedly exceeded the threshold on Aug.
threshold value is 10. It remained above the threshold for 10 seconds. problem so the AACS team is investigating the cause. sent up tomorrow, and the background sequence will follow on Thursday. addition, Periodic Engineering Maintenance (PEM) was performed today. a campaign to obtain Tethys orbit crossing data and E ring measurements. Mimas, Helene and Rhea observations are among the planned activities. 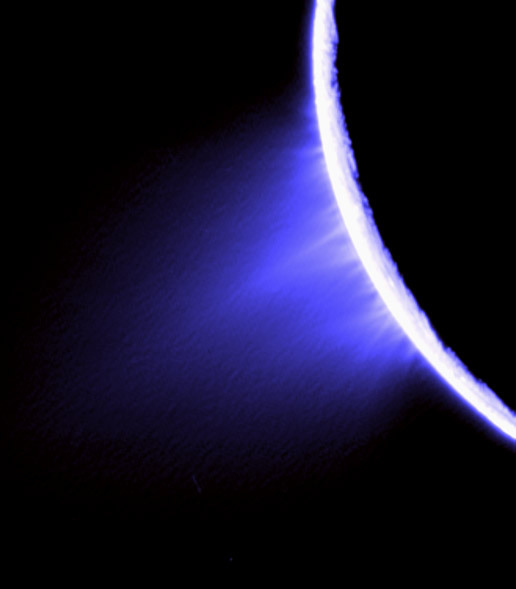 Also today the second Enceladus Plume Debris working group meeting was held. software for planning flyby scenarios. Navigation and Spacecraft teams, but other offices are also represented. via real time commanding on Wednesday, August 23. Infrared Mapping Spectrometer (VIMS) jointly observed Mimas for 7 hours. UVIS is searching for a possible atmosphere on this icy satellite. Recently Cassini Outreach launched an RSS feed. There is now an orange "RSS"
rectangular button on the left labeled RSS. UVIS performed several slow scans across Saturn's visible hemisphere. photograph Titan at 140 degrees phase. 10.0 of CDA flight software. Saturn's northern hemisphere in a search for lightning. Thanks for the extensive info! I'd been looking for these kind of summaries for quite a long time, it's nice to have them together like this. Keep on with it! The Encounter Strategy Meeting for Titan 17 and Titan 18 was held today. and how these particles undergo an intricate dance as they orbit Saturn. monthly "Science 101" lecture series. The Optical Remote Sensing Instruments were quite busy this week. direction, with a run-down time of 38 minutes. interruption to the downlink occurred. or not perform the update. schedule a test of the Titan 20 flyby in the Integrated Test Laboratory. week, and the final development process will kick-off on September 12. The Titan 17 flyby (T17), at 1000 km altitude, occurred September 7, 2006.
by AACS after the flyby was considerably lower than expected, around 20%. observed a stellar occultation through Titan's atmosphere. approach to continue Titan global mapping and atmospheric analysis. atmospheric and ionospheric thermal structures. back the Titan flyby data. today. The Enceladus flyby was at an altitude of 39,932 km. segment slightly over 6 hours in duration, and almost centered on periapsis. during Orbit 68 in May of 2008.
scheduled for September 27 and October 16 after the T18 and T19 flybys. The Science Operations Plan Update process for S27 kicked off today. The final approval meeting was held today for the S24 background sequence. the background sequence going up on September 18.
execute as expected beginning on DOY-258. begins execution on Friday, November 24. A beautiful image of Saturn at night is Astronomy Picture of the Day today. station losses and the concomitant data cuts that would be required. 264/13:05-18:54, and a backup window of DOY 265/12:50-18:39.
coverage of the magnetotail and plasma wake. Cassini scientists are on the trail of the missing moons of Saturn. A recent observation by the spacecraft leads them to believe that they will find the moons near newly discovered rings around the planet. During an unprecedented opportunity, with the sun poised behind Saturn, Cassini scientists discovered two new rings and confirmed the presence of two others. The new rings are associated with one or more small mooCassini scientists are on the trail of the missing moons of Saturn. A recent observation by the spacecraft leads them to believe that they will find the moons near newly discovered rings around the planet. During an unprecedented opportunity, with the sun poised behind Saturn, Cassini scientists discovered two new rings and confirmed the presence of two others. The new rings are associated with one or more small moons and share their orbits with the moons, while scientists suspect a moon is lurking near a third ring. Scientists have recently discovered that the planet Saturn is turning 60 –not years, but moons. "We detected the 60th moon orbiting Saturn using the Cassini spacecraft's powerful wide-angle camera," said Carl Murray, a Cassini imaging team scientist from Queen Mary, University of London. "I was looking at images of the region near the Saturnian moons Methone and Pallene and something caught my eye." The newly discovered moon first appeared as a very faint dot in a series of images Cassini took of the Saturnian ring system on May 30 of this year. After the initial detection, Murray and fellow Cassini imaging scientists played interplanetary detective, searching for clues of the new moon in the voluminous library of Cassini images to date. The Cassini imaging team's legwork paid off. They were able to locate numerous additional detections, spanning from June 2004 to June 2007. "With these new data sets we were able to establish a good orbit for the new moon,” said Murray. "Knowing where the moons are at all times is important to the Cassini mission for several reasons." One of the most important reasons for Cassini to chronicle these previously unknown space rocks is so the spacecraft itself does not run into them. Another reason is each discovery helps provide a better understanding about how Saturn's ring system and all its billions upon billions of parts work and interact together. Finally, a discovery of a moon is important because with this new knowledge, the Cassini mission planners and science team can plan to perform science experiments during future observations if and when the opportunity presents itself. What of this new, 60th discovered moon of Saturn? Cassini scientists believe "Frank" (the working name for the moon until another, perhaps, more appropriate one is found) is about 1.2 miles (2 kilometers) wide and, like so many of its neighbors, is made mostly of ice and rock. The moon's location in the Saturnian sky is between the orbits of Methone and Pallene. It is the fifth moon discovered by the Cassini imaging team. 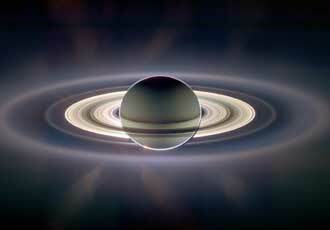 "When the Cassini mission launched back in 1997, we knew of only 18 moons orbiting Saturn," said Murray. "Now, between Earth-based telescopes and Cassini we have more than tripled that number – and each and every new discovery adds another piece to the puzzle and becomes another new world to explore." Murray and his colleagues may get the chance to explore Saturn's 60th moon. The Cassini spacecraft's trajectory will put it within 7,300 miles (11,700 kilometers) in December of 2009. The Cassini-Huygens mission is a cooperative project of NASA, the European Space Agency and the Italian Space Agency. NASA's Jet Propulsion Laboratory, a division of the California Institute of Technology in Pasadena, Calif., manages the Cassini-Huygens mission for NASA's Science Mission Directorate, Washington, D.C. The Cassini orbiter and its two onboard cameras were designed, developed and assembled at JPL. The imaging team is based at the Space Science Institute, Boulder, Colo.
instruments in 2004 and 2005.
lead author on the Science paper. a mystery. The rings are labeled in the order they were discovered. -- interior to C -- and F, E and G, outside the main rings. are in the ring arcs of Neptune. equivalent to that of a 328-foot-wide, ice-rich small moon. from the arc 18 months from now." instrument team is based at Johns Hopkins University, Laurel, Md. With data from the Cassini spacecraft, an international team of scientists may have identified the source of one of Saturn's more mysterious rings. The enigmatic G ring is likely produced by relatively large, icy particles that reside within a bright arc on the ring's inner edge. 21, and will reach 5 degrees again when conjunction completes on August 27. August 24, when the SEP angle has increased to about 3 degrees. instrument teams concurred that they could support the schedule. The S35 science operations plan update (SOPU) completed today. commands "got through" the interference from the sun. Conference August 20-23, 2007, in Hilton Head, South Carolina. 2007. Uplink is set for the end of September. January, 2004, 128568 ISS images have been acquired. 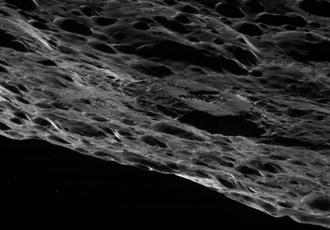 Cassini completed its closest flyby of the odd moon Iapetus on Sept. 10, 2007. The spacecraft flew about 1,640 kilometers (1,000 miles) from Iapetus' surface and is returning amazing views of the bizarre moon. Scientists are on the trail of Iapetus' mysterious dark side, which seems to be home to a bizarre 'runaway' process that is transporting vaporised water ice from the dark areas to the white areas of the Saturnian moon. First direct proof that the jets (formed by water ice in large quantities) indeed come from the moon's surface "tiger stripes"' hot spots. Newly assembled radar images from the Cassini spacecraft provide the best view of the hydrocarbon lakes and seas on the north pole of Saturn's moon Titan, while a new radar image reveals that Titan's south polar region also has lakes. The southern region images were beamed back after an Oct. 2 flyby in which a prime goal was the hunt for lakes at the south pole. A new mosaic image, created by stitching together radar images from seven Titan flybys over the last year and a half, shows a north pole pitted with giant lakes and seas, at least one of them larger than Lake Superior. Approximately 60 percent of Titan's north polar region above 60 degrees latitude has been mapped by Cassini's radar instrument. About 14 percent of the mapped region is covered by what scientists interpret as liquid hydrocarbon lakes. "This is our version of mapping Alaska, the northern parts of Canada, Greenland, Scandinavia and Northern Russia," said Rosaly Lopes, Cassini radar scientist at NASA's Jet Propulsion Laboratory, Pasadena, Calif. "It's like mapping these regions of Earth for the first time." Lakes and seas are very common at the high northern latitudes of Titan, which is in winter now. Scientists say it rains methane and ethane there, filling the lakes and seas. These liquids also carve meandering rivers and channels on the moon's surface. Now Cassini is moving into unknown territory, the south pole of Titan. "We wanted to see if there are more lakes present there and, sure enough, there they are, three little lakes smiling back at us. Titan is indeed the land of lakes and seas," said Lopes. "It will be interesting to see the differences between the north and south polar regions." It is now summer at Titan's south pole. A season on Titan lasts nearly 7.5 years, one quarter of a Saturn year, which is 29.5 years long. Monitoring seasonal change helps scientists understand the processes at work there. Scientists are making progress in understanding how the lakes may have formed. On Earth, lakes fill low spots or are created when the local topography intersects a groundwater table. Lopes and her colleagues think that the depressions containing the lakes on Titan may have formed by volcanism or by a type of erosion (called karstic) of the surface, leaving a depression where liquids can accumulate. Karstic lakes are common on Earth. For example in parts of Minnesota and central Florida there are hundreds of such lakes. "The lakes we are observing on Titan appear to be in varying states of fullness, suggesting their involvement in a complex hydrologic system akin to Earth's water cycle. This makes Titan unique among the extra-terrestrial bodies in our solar system," said Alex Hayes, a graduate student who studies Cassini radar data at the California Institute of Technology in Pasadena. "The lakes we have seen so far vary in size from the smallest observable, approximately 1 square kilometer (0.4 square miles), to greater than 100,000 square kilometers (40,000 square miles), which is slightly larger than the Great Lakes in the Midwestern U.S.," Hayes said. "Of the roughly 400 observed lakes, 70 percent of their area is taken up by large "seas" greater than 26,000 square kilometers (10,000 square miles)." Future radar flybys will image closer to the southern pole and are expected to show more lakes. For images and more information visit: http://www.nasa.gov/cassini and http://saturn.jpl.nasa.gov . Somewhere deep below Saturn's cloud tops, the planet rotates at a constant speed. Determining this interior period of rotation has proven extremely complicated. Now, with new Cassini results, a team of European scientists have taken an important step forward.